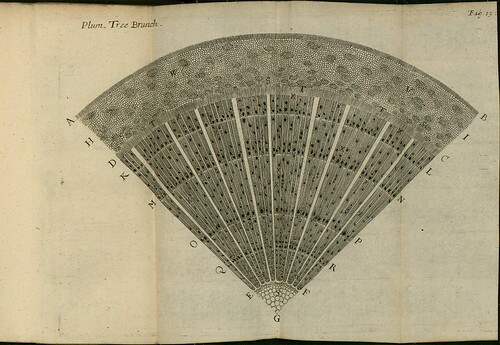 To the end we may know and clearly underſtand what the Trunk, Stalk, or Branch of a Plant is; I ſhall, by theſe figures here before us, deſcribe the ſeveral Parts whereof it is compounded. 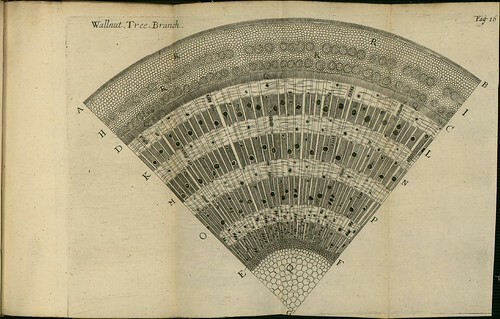 And, for examples ſake, I ſhall in the firſt place, deſcribe the Trunks of ſix ſeveral kinds of Plants, as they appear to, and are obſervable by the naked eye. 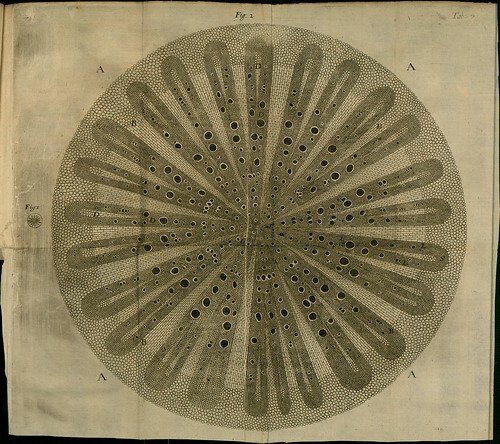 Which having done, I ſhall next proceed to a more particular Deſcription of divers other Trunks and Branches as they appear through the Microſcope I made uſe of. In both ſhewing, not only what their ſeveral Parts are, as belonging to a Branch; but alſo by a comparative proſpect, in what reſpects they are ſpecifically diſtinugiſhed one from another, in the ſeveral ſpecies of Branches. 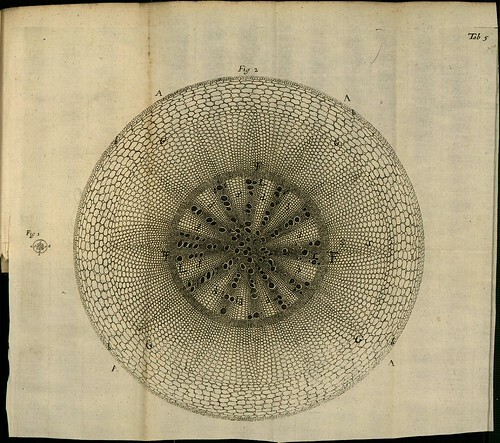 If we take into account of the degrees whereunto the knowledge of Vegetables is advanced, it appeareth that their Descriptions, Places, and Seaſons are with good preciſeneſs and curioſity ſet before us. Likewise, that we are informed of the Natures and infallible Faculties of many of them. Whereunto ſo many as have aſſiſted, have much obliged by their Poſterity. By due reflection upon what they have performed, it alſo appears, what they have left is imperfect, and what undone. For the Vertues of many Vegetables are with much uncertainty, and too promiſcouſly aſcribed to them. And of the Vertues of many they are altogether ſilent. And although, for the finding out and just appropriation of them, they have left us some Rules, yet not all. The Deſcriptions likewise of many are yet to be perfected; as alſo their Draughts, eſpecially as to their Roots. And their proper ranks and affinities much undetermined. But for the Reaſon of Vegetation, and the Cauſes of all thoſe infinite varieties therein obſervable (I mean ſo far as matter, and the various affections hereof are inſtrumental thereto) almoſt all men have ſeemed to be unconcerned. That nothing hereof remaineth further to be known, is a thought not well calculated. For if we consider how long and gradual a Journey the knowledge of Nature is, and how ſhort a time we have to proceed therein; as on the one hand, we ſhall conclude it our eaſe and profit to ſee how far others have gone before us: ſo ſhall we beware on the other, whilſt we have a juſt value for thoſe who were but her Diſciples and inſtructed by her. Their time and abilities both being ſhort to her, which as ſhe was firſt deſigned by Divine Wiſdom, ſo may her vaſt dimenſions beſt be judged of, in being compared therewith. It will therefore be our prudence, not to inſiſt upon the invidious queſtion, which of her Scholars have taken the faireſt meaſure of her; but to be well ſatiſfied, that as yet ſhe hath not be circumſcribed by any. Nor doth it more behove us to conſider how much of the Nature of Vegetation may lie before us yet unknown, than to believe a great part thereof to be knowable: not concluding from acknowledged, much leſs ſupported inſucceſſfulneſs of any mens undertakings; but from what may be accounted poſſible as to the Nature of things themſelves; and from Divine Providence, by infinite ways conducting to the knowledge of them. Neither can we determine how great a part this may be; becauſe it is impoſſible to meaſure what we ſee not. And ſince we are most likely to under-meaſure, we ſhall hereby but intrench our endeavours, which we are not wont to carry beyond the Idea which we have of our Work. And how far ſoever this kind of Knowledge be attainable, its being ſo far alſo worthy our attaintment will be granted. For beholding the many and elegant varieties wherewith a Field or Garden is adorned, who would not ſay, That it were exceeding pleaſant to know what we ſee; and not more delightful to one who has eyes, to diſcern that all is very fine; and to another who hath reaſon, to underſtand how. This ſurely were for a man to take a true Inventory of his Goods, and his beſt way to put a price upon them. Yea it ſeems that this were not only to be partaker of Divine Bounty; but alſo, in ſome degree, to be Copartner in the Secrets of Divine Art. Consider what's known about vegetables: the facts relating to their description, location and seasonal activity have been already established, right? And of course we should be grateful that people in the past have compiled and passed on this information for us, right? Right?! Or maybe we should give this some more thought. On closer inspection, we can see that many of the details in this so-called knowledge bank about vegetables are either missing or inaccurate. The qualities or benefits ascribed to some vegetables are simply wrong and there has been a tendency in the past to indiscriminately link specific qualities to plants without evidence. Many of their properties are in fact unknown. 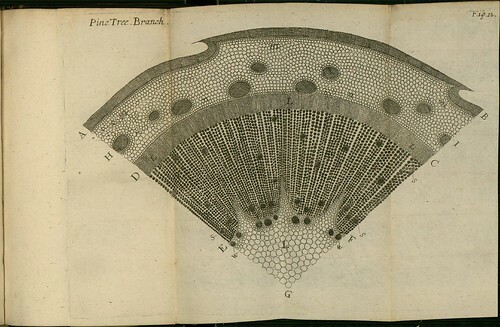 The process our ancestors followed in compiling the known characteristics of plants did establish some standards by which further knowledge could be acquired, but these rules are actually incomplete. The descriptions of vegetables and our comprehension of their underground properties - particularly the root systems - are likewise incomplete. Vegetables haven't been properly classified to date and there is still a lot to learn about the optimal growth conditions for each species. Despite the incredible abundance of plants in our environment, it remains baffling that most people don't seem particularly disposed to learning more about them. It's fundamentally illogical to assume that the amount we know about plants at the moment is all that there is to be known. Mother nature has evolved over a long time in comparison to our relatively short period on earth so we are wise to have some regard for the observations passed on by our forebears. The age and complexity of our environment reinforces the likelihood of our obtaining benefits from contrasting our discoveries with previously held 'facts'. When considering that particular body of knowledge, it's best that the emphasis not be placed on deciding which scholar or which scientist has contributed the most to our level of understanding of the natural world; rather, it should underline the fact that no single person can ever hope to accomplish the task. 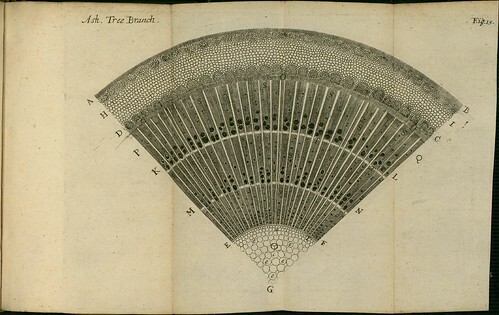 We shouldn't dwell on the vastness of the natural world that remains obscure and unknown to us and conclude that because certain botanical facts weren't revealed in history that they are therefore out of reach now, because it is within our abilities to make new discoveries. We just don't know how ignorant we are and there is no way to determine the magnitude of that deficit. 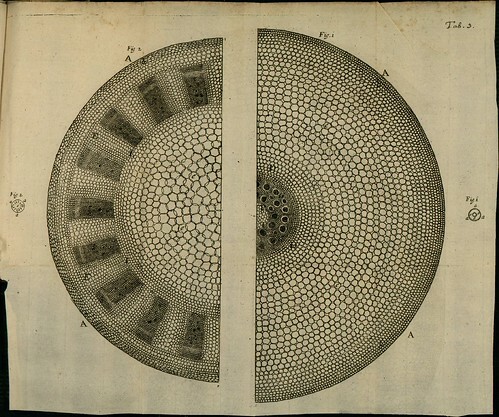 And because our guesses are likely to underestimate the shortfall in our knowledge of the natural world, we should refrain from attempting to impute the characteristics derived from our own studies of vegetables to plants outside of the cumulative knowledge base or outside of our own environment. The extent of all possible knowledge about nature only serves to make our own modest educational endeavours worthy of respect. The pleasures of observing the diversity of plant life in a field or a garden are enhanced by knowing what plants we can see. For the thinking person, the pleasure is increased further by knowing how those plants came into being and how they function. Having an understanding of the properties of one's garden vegetables is surely the best way to both fully appreciate them and judge their true value. Our destiny imposes a duty to achieve a balance with our environment that goes beyond mere exploitation. Et Voilà! Feel free to disagree with the interpretation and rendering. It's at least as difficult attempting to comprehend the tone as it is the content of 17th century English. That was hard! Just sidestepping any quibbles on the semantics front, we are reading some enlightened scientific writing here. 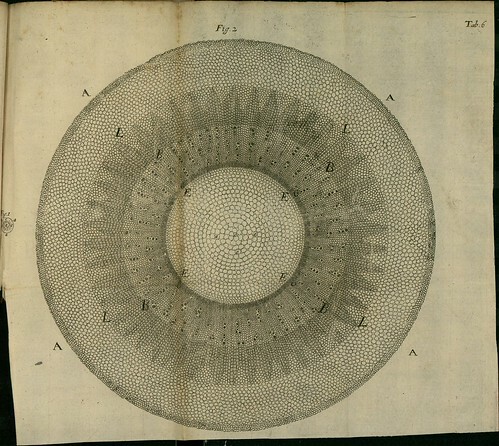 The quotes (and all the images) are from books by Nehemiah Grew (1641-1712), an English physician, vegetable and plant anatomist and one time secretary of the Royal Society. 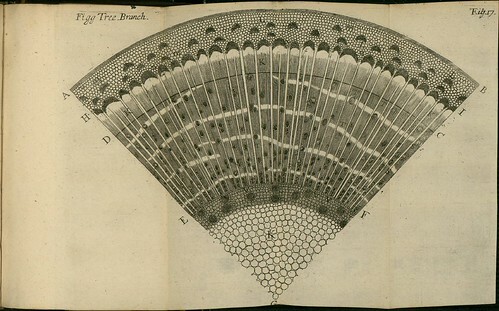 He was a contemporary of (and collaborator with) Marcello Malpighi (previously: one; two) and therefore one of the first scientists to publish a work that relied upon findings from microscope observations. 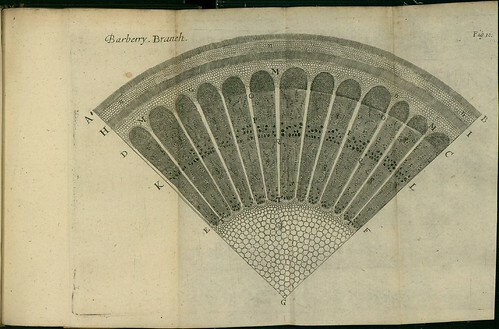 Between them they were responsible for establishing plant anatomy as an academic subject. 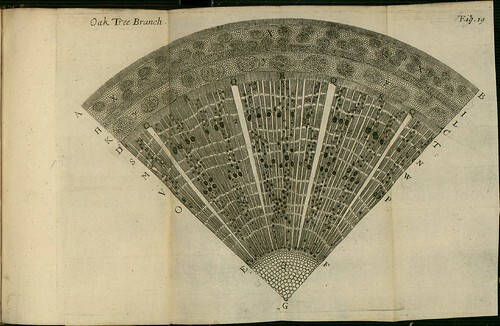 The trunk sections (above) and root sections (below) come from two separate works but Grew's renown was secured when these shorter works were combined with further anatomical treatises in his magnum opus, 'Anatomy of Plants', published in 1682. The images above come from 'The Comparative Anatomy of Trunks', 1675, at SICD. 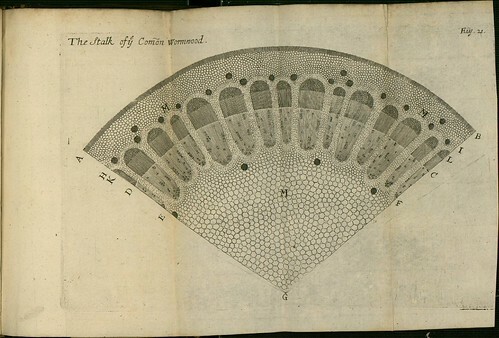 Grew's 'Anatomy of Plants' is online at the Botanicus website and contains more than eighty plates. A kindred soul to this post: The Wood Book. Very fun indeed and I am impressed that the long S can be rendered properly in html code. 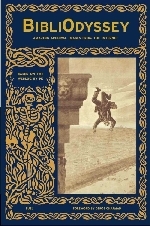 The text has a strange appeal (with or without long S, original language or paraphrase). Once again, I am enormously grateful. You have no idea. Oh...something I forgot about: that chunk of text I reconfigured was, as I recall, constructed from a paper or a presentation given to the Royal Society, which probably accounts, at least part way, for the reason I found it difficult to unravel its tone. It was part speech, part dissertation and maybe part theatrics. The top ones look like elaborate ladies' fans. So lovely. Nice drawings representing the hard work of the true geniuses of the past. Today such work using a computer would create more precision, but would somehow be lest elegant. and do they call it dumpster diving in australia too??! This is splendid, fascinating, gorgeous, and precisely the sort of thing I've been trying to learn about. Umm-In spite of the fact that I've come across the information here rather than in a library--would you mind if I use some of it? I have to wonder how close to reality are these illustrations? 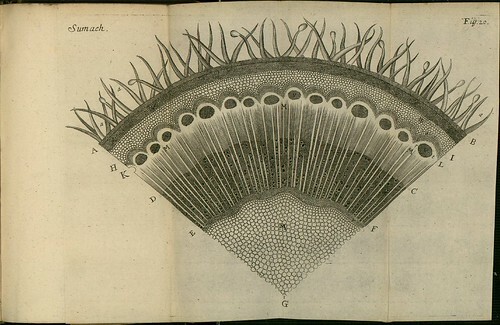 Some look a bit fanciful to my non-botanist, but microscope- enthusiast eye.